In a large pan, brown mince and onions, add Recipe Base, carrot and water; stir well. Cover and simmer gently for 10 minutes, stirring regularly. Combine mash potato and cheese. 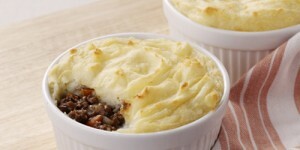 Divide mince mix between 4 bowls, topping each with the potato mix. Place in oven and bake for 15 minutes, or until tops are golden. Hint: For traditional “pie floaters”, top each pie once cooked, with mushy green peas and gravy. Mushy peas: 1 cup frozen peas, cooked as directed, and mashed with a potato masher. Finish with 1 teaspoon Flora Buttery spread. Gravy: Prepare 1 packet Continental Brown Onion Gravy as directed.